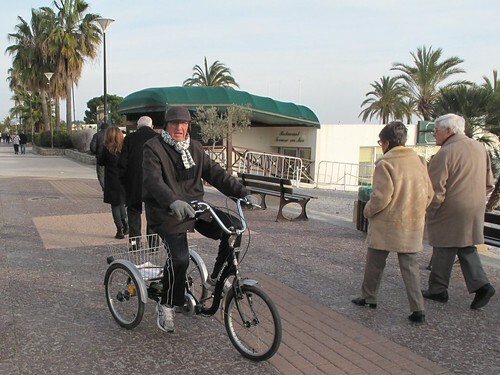 On my latest trip to France, I saw more people cycling in athletic-wear or comfort clothing than I did in the fashionable apparel that we typically imagine most Frenchies wear. It could be the winter season, when perhaps fashion-minded people in France decide to take public transportation. Who really knows, and really, who am I to judge? Take this senior gentleman on a tricycle, for instance. Unique and amazing in his own right. How can I judge a man on a bike by his choice of clothes? Should it not be enough to applaud his efforts and live by his example? Bravo for your bravery, sir. Ride on into the sunset! I have to smile, Kristin, because even when "dressed down" Europeans always seem to look just right. My sis travels to Germany and possibly Paris in a few weeks. I've asked her for some bikey street shots. Wonder if she'll see any trikes like this gentleman's? I'm just thankful that he isn't wearing cycling shorts. Saw lots of guys in spandex, after all. It's France. Home of the Tour. I question his choice of footwear and I've never been a big fan of piping (one of the reasons the makers of "Cycle Chic" clothing miss me as a market; they seem to be congenitally unable to refrain from from putting reflective piping on frickin' everything), but other than that I think he looks smashing. @kfg - I think at his age, he can wear whatever he damn well pleases on his feet, and he'd probably have no problem telling you that! Of course he can, Lord knows I do.